Casio Privia PX-160, a fantastic digital piano using Casio’s renowned AiR Sound Source and the incredible Tri-Sensor Scaled Hammer Action ..
Casio Privia PX-160, a fantastic digital piano using Casio’s renowned AiR Sound Source and the incredible Tri-Sensor Scaled Hammer Action II keyboard. 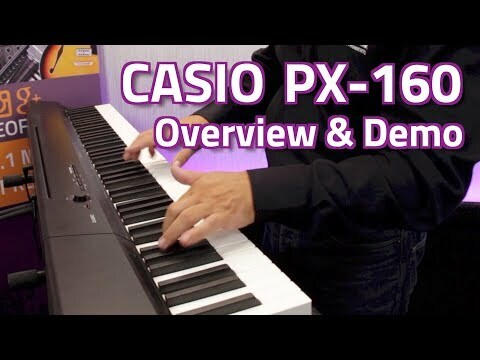 Successor to the immensely popular PX-150, Casio brings us the new Privia PX-160 which utilises their famous AiR Sound Source and the incredible Tri-Sensor Scaled Hammer Action II keyboard, together delivering amazing sound and playing response. Numerous enhancements to this digital piano make the PX-160 a fantastic upgrade over the PX-150. Utilising Casio’s proprietary sound source; AiR (Acoustic and intelligent Resonator) provides the Privia PX-160 amazingly lifelike grand piano sounds. In order to achieve this amazing sound, Casio recorded the sound of a 9-foot concert grand piano at four dynamic levels, with the AiR engine delivering the sound with seamless dynamics for an extremely expressive and powerful performance. AiR even simulates Damper Resonance when you use the damper pedal in order to achieve another level in realistic piano sound. To achieve a fantastic playing feel to match the incredibly lifelike sound of the PX-160, Casio have installed their famous Tri-Sensor Scaled Hammer Action II keyboard. Featuring new simulated Ebony and Ivory textured keys, this has the feel of a real grand piano and its three sensors accurately capture the dynamics of your performance. Casio’s own proprietary Hammer Response simulates the different speeds at which the different sized hammers move inside an acoustic grand piano while taking into account the velocity of your performance for an extremely accurate key-to-sound experience. Great for composing for multiple instruments or just enjoying more diversity in your playing, in addition to the amazing grand piano sound, the Casio PX-160 features electric pianos, harpsichord and more. Newly developed for the PX-160 are string ensemble sounds – rich stereo audio that sound amazing on their own but can also be layered with the key instrument sounds. Adding extra value, the electric piano sounds onboard the PX-150 have been updated to deliver the same dynamic sounds found on the award-winning Casio PX-5S stage piano. Casio’s PX-160 digital piano has benefited from a redesign of the chassis which lends it a more elegant look while also accommodating a new 8w x 8w speaker system. With an open front and ported back, this speaker system provides remarkable sound quality when the PX-160 is placed against a wall while also being great for performances, delivering great sound towards your audience or classroom. Split and layer capabilities of the PX-160 allow you to play bass in your left hand while you can perform with two layered tones with your right hand. Duet mode allows you to split the keyboard into to equal ranges which is perfect for lessons with the student and teacher sitting side by side or performing duets with a friend or family member. A built-in two track recorder allows you to record and playback performances and practice sessions so you can enjoy your compositions or analyse your playing. Two headphone outputs allow you to practice at any time you want without disturbing family or neighbours while ¼” left and right line outputs on the rear panel allow you to connect the PX-160 to a sound system when performing live. USB and USB MIDI connectivity allow you to connect to an assortment of other devices and software adding an incredible amount of performance and recording potential to the Privia PX-160. In short, the Casio Privia PX-160 is an extremely well-made digital piano with incredibly lifelike sounds and an amazingly realistic playing feel, all at a great price.